PIGEON FORGE, Tenn. (April 27, 2016) – Dolly’s Homecoming Parade, Pigeon Forge’s annual salute to hometown superstar Dolly Parton, regularly attracts tens of thousands of spectators, but this year’s potential audience could be exponentially larger because it will be one of the first live stream feeds presented onFacebook. Facebook launched live video streaming earlier this month, and this event will feature one of the world’s most recognized personalities. 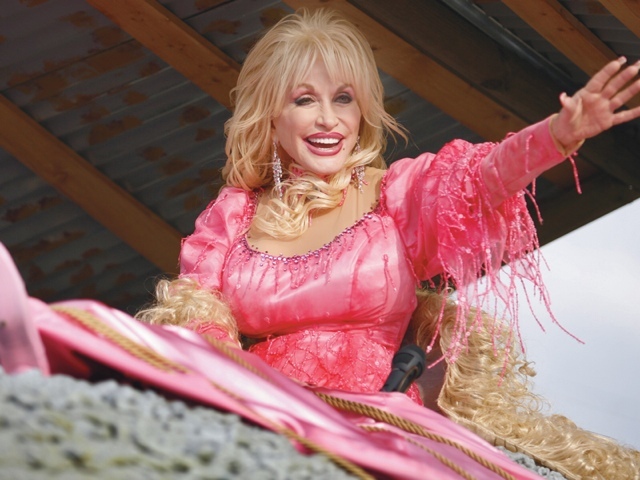 Dolly will lead the parade atop a float themed for her new theater in Pigeon Forge, Dolly Parton’s Lumberjack Adventure Dinner & Show , and the live stream will chronicle the entire event. The parade steps off at 6 p.m. on May 6 (Friday) on a route that covers three miles of the famous Parkway through the heart of Pigeon Forge. The live stream will be from Dolly’s float and will show Dolly, the crowds along the Parkway, and views of the city and the surrounding Great Smoky Mountains. This will be the 31 st presentation of Dolly’s Homecoming Parade and the first time it will be streamed live on the Internet. The stream will be on Dolly Parton’s Facebook page and Dolly Parton’s Lumberjack Adventure Dinner & Show Facebook page. Streaming information is atLumberjackAdventure.com andDollyParton.com. Every year, the parade adds a Norman Rockwell atmosphere to Pigeon Forge, a gateway city to Great Smoky Mountains National Park. It features high school marching bands, equestrian units, veterans’ groups, twirlers, antique tractors and much more. There are 125 groups in the 2016 parade. This year’s high school bands are from Sevier County High School (Dolly was a member in her high school days), Pigeon Forge High School, Fyffe High School from Fyffe, Alabama, and Cheatham County Central High School from Ashland City, Tennessee. Complete Pigeon Forge visitor information is available online atMyPigeonForge.com and by calling 800-251-9100. Thanks for posting this great article, Larry! Will U b at the opening weekend festivities this year?